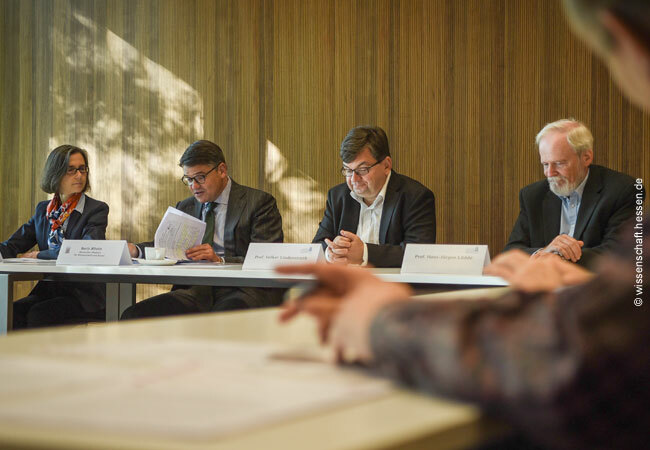 Boris Rhein, Hessen Minister of Higher Education, Research and the Arts (second from left) presents the concept of the new GOETHE supercomputer with Professor Simone Fulda, Professor Volker Lindenstruth and Professor Hans-Jürgen Lüdde (from left). A new supercomputer, on course to set new standards in the field of green IT, is currently being developed at Goethe University under the leadership of Professor Volker Lindenstruth (professorship for supercomputer architecture). The tremendously energy-efficient computer, whose development costs are comparatively low, is based on a large number of high-performing, interconnected graphic cards, and a cooling system that utilizes river water from the Main. The water cooling system lowers the primary energy use for cooling to just about 8%. Other computing centres require six to ten times this amount of energy for cooling. In 2014, a supercomputer built according to the Lindenstruth’s construction principle achieved the number one slot in the world ranking of energy-efficient supercomputers. The new GOETHE supercomputer in the Industrial Park Höchst, which is to be realized according to a construction principle further optimized yet similar to its predecessor, will be constructed in two phases. The first construction phase will be concluded by 13th December 2018 and cost approximately € 4.5m. The total costs amounting to € 7.5m will be financed by 50% from federal funds and by 50% from Goethe University and FIAS funds. The result will be a supercomputer with 18,880 highly interconnected computing cores at its first stage. This translates into a tripling of the computing performance of the preceding model, the LOEWE-CSC, which also began operation in the Industrial Park Hoechst at the end of November 2010. At the time, it was the most energy-efficient supercomputer in Europe according to the international ranking “Green 500”.